Complex coloring printables are provided to study coloring skills—not the skill of staying between the lines, but the skills of the use of color in design. 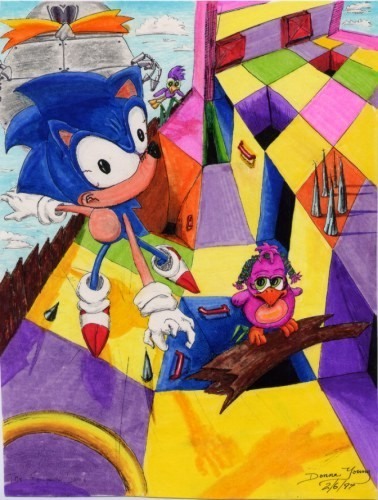 A simpler beginning to color use in design would be found in this Sonic the Hedgehog™ drawing. I drew this for my children years ago and handed it to them. I challenged them to color it based on certain guidelines. I can't remember what I said to them now, it was so long ago. To show them, I colored one and mine is the one pictured. When they were finished, it was obvious to me that they needed further study in this field or they were too young for the assignment. At the time they were 7 and 10. "Images are more than a coloring book. And now, almost 20 years after their first publication, these successful backlist titles are now being combined into 2 big bind-ups with new and exciting covers. Each volume in the series of ready-to-color pattern books stimulates the imagination with an infinite number of forms nested within complex geometric shapes. There is no age limit to the creativity and fun to be found on the pages of these totally unique coloring books!" "Images are more than a coloring book -- it’s an activity book that stimulates your visual creativity! And now, almost 20 years after their first publication, these successful backlist titles are now being combined into 2 big bind-ups with new and exciting covers. Each volume in the series of ready-to-color pattern books stimulates the imagination with an infinite number of forms nested within complex geometric shapes. There is no age limit to the creativity and fun to be found on the pages of these totally unique coloring books!